This is a shoulder bag that I made for a co-worker. She is crazy about butterflies. I used royal blue and yellow because that was her wedding colors. The bag can be made in any color or combination of colors. The lining is optional. ¼ yard of royal blue fabric. NOTE: THE WAY YOU DO YOUR IS UP TO YOU. I MADE FOUR ACCORDING TO THE PATTERN BELOW. FOR THE OTHER FOUR, I SWAPPED THE COLORS. Rd 1: With royal, (5 dc, ch 2, 5 dc, ch 2, 5 dc, ch 2) in magic ring, slip st in first dc changing to yellow. Rd 2: Ch 2, [dc in next 5 dc, (2 dc, ch 2, 2 dc) in next ch-2 space] around, slip st in first dc changing to royal. Rd 3: Ch 2, [dc in next 7 dc, (2 dc, ch 2, 2 dc) in next ch-2 space, dc in next 2 dc] around, slip st in first dc changing to yellow. Rd 4: Ch 2, [dc in next 9 dc, (2 dc, ch 2, 2 dc) in next ch-2 space, dc in next 4 dc] around, slip st in first dc changing to royal. Rd 5: Ch 2, [dc in next 11 dc, (2 dc, ch 2, 2 dc) in next ch-2 space, dc in next 6 dc] around, slip st in first dc. Finish off. Weave in ends. Sew 2 WINGS PANELS together overlapping 2 rows. Finish off. Weave in ends. Sew BODY to ASSEMBLED WINGS. Rd 1: Attach royal in bottom corner ch-2 of upper WING PANEL, ch 1, 3 sc in same ch-2 space as attachment, sc in next 21 sc, 3 sc in next ch-2 sc, sc in next 15 sc, sc in next 24 sc on top of BODY, sc in next 15 sc on WING PANEL, 3 sc in next ch-2 space, sc in next 21 sc, 3 sc in next ch-2 space, 3 sc in next ch-2 space on next WING PANEL, sc in next 21 sc, 3 sc in next ch-2 space, sc in next 21 sc, 3 sc in next ch-2 space, sc in next 2 sc, sc in next 8 sc on bottom of BODY, sc in next 2 sc on next WING PANEL, 3 sc in next ch-2 space, sc in next 21 sc, 3 sc in next ch-2 space, slip st in first sc. Finish off. Weave in ends. Repeat on side of BUTTERFLY. Rw 1: Attach royal in ch-2 on WING PANEL, ch 1, sc in next 21 dc, slip st in BODY. Rw 1: Attach royal in BODY, ch 1, sc in next 21 dc on WING PANEL, slip st in ch-2 space. Attach yellow to head of BODY and ch 5. Finish off. Repeat on opposite side of head of BODY. Repeat on head of BODY on other side of PURSE. Rws 2-120: Ch 1, turn; sc in each sc across. (6) Change to royal after Rw 170. Finish off. Weave in ends. Sew 7-inch zipper to top of POCKET. Using blue fabric, cut pieces in the same shape as assembled BUTTERFLY PURSE FRONT and BACK with 3-inches on all sides. Sew POCKET to one side of LINING. Sew LINING pieces together. 1. Sew HANDLE to BUTTERFLY PURSE FRONT. 2. 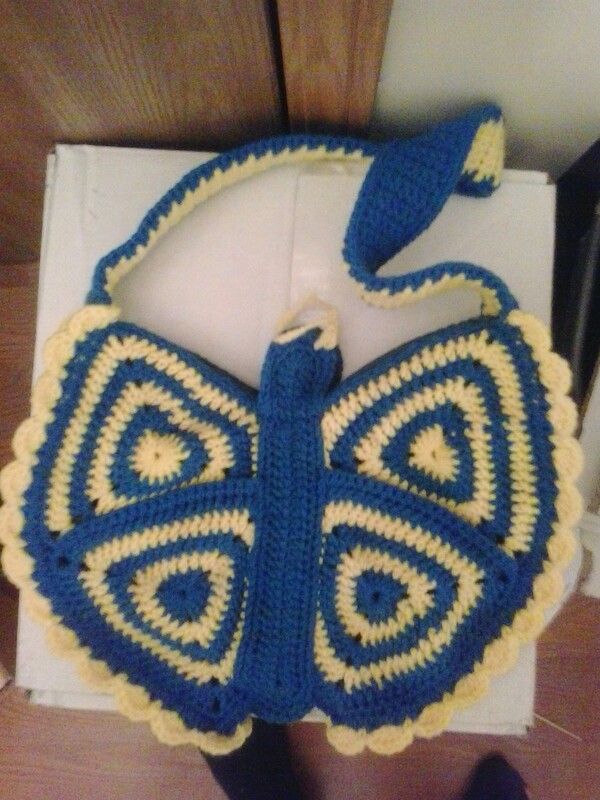 Sew HANDLE to BUTTERFLY PURSE BACK. 3. Sew bottom of BUTTERFLY PURSE closed. 4. Sew LINING inside of BUTTERFLY PURSE. 5. Sew 12-inch zipper to top of BUTTERFLY PURSE. Rw 1: Attach yellow in same sc as HANDLE attachment with top WING point and working down WINGS, ch 1, sc in same sc as attachment, (skip next sc, 5 dc in next sc, skip next sc, sc in next sc) 13 times, turn, working up WINGS, (skip next sc, 5 dc in next sc, skip next sc, sc in next sc) 13 times. Finish off. Weave in ends. Repeat along the other WINGS. This pattern is an original pattern © by Christjan Bee (February 2018). Please do not claim this pattern as your own. If you wish to share this pattern, you may link to this pattern but please do not reprint it on your site. You may keep a copy for your own personal use, but you may not sell or distribute it, or sell items made from this pattern.